In each comic crate we’ll include some blast from the past retro gems, along with plenty of modern classics and niche collector’s items. Like all of our monthly subscription boxes, our special comic plan is reasonably priced and designed to save you the maximum amount of money every time. Getting your hands on the latest graphic novels and more obscure superhero titles can be time-consuming and costly, plus with some suppliers you can never be sure of what exactly you’ll get. Our standard plan includes sixteen comics of outstandingly awesome proportions. We’ll pack every item up with the greatest of care to ensure it remains in perfect condition whilst being transported, and then you can look forward to an unboxing fest when your Super Loot crate arrives. If you can, why not take the time to share you experience with us and the rest of the Super Loot community online? We’re always happy to hear you’re happy, plus if you make a truly stunning contribution we’ll throw in an extra surprise in your next box. 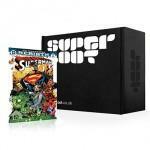 Please note your comics will not be delivered in the box pictured but a book box with a superloot branded sticker. Be the first person to tell us what you think about Super Loot Comic Box and you'll save £2.50 on your next purchase!